Taking a break from all my posts on curing meat, I wanted to introduce my favorite bread of the last month. It’s my basic bread recipe of 2 parts white bread flour, 1 part whole wheat flour, 0.5 part wheat germ, and then salt, molasses, an egg, and milk to bind it. The bread is chewy, crusty, and a little dense and malty from the whole wheat and molasses. But what makes it so tantalizing to me is the addition of dry-cured olives and dried fruit. 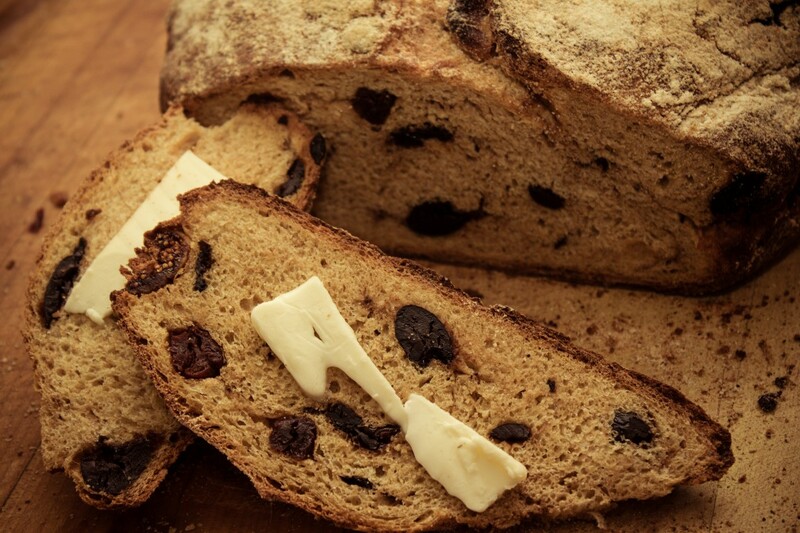 Each slice is studded with dense, chewy olives and dried fruit. Although they mirror each other in texture, one delivers an bold, salty, umami savoriness, while the other an intensely fruity but modestly sweet note of brightness. I know many people don’t care for olives, and I don’t think this bread will convert them, but the classic salty-sweet combination really brings me back to this recipe again and again. Olive bread isn't anything new, but my route of discovery for creating this bread is a little roundabout. I was turned on to this idea by black olive shortbread cookies. Called scourtins in France, these are just what they sound like; buttery, sugary, crumbly cookies studded with slivers of olive. I love, love, love them, a love that is only stronger from my initial hesitation of, “that sounds awful.” But that hesitation melted into pure delight upon my first timorous nibble. Now I've made this bread at least four, but I think five, times. I've thought about using other olives, but I keep coming back to the bold, meaty, and slightly leathery dry cured black olive. Unlike other olives, which are soaked in multiple changes of salt water to draw out their astringent taste, dry cured olives are simply packed in salt and hung in a sack. I’m sure the process is actually more refined that that, but that’s the gist of it. And it beats grocery black olives, which are cured with lye. So as the olives sit in the salt, the salt naturally leaches out the astringent oleuropein and carbolic acid in freshly picked olives. The resulting olives look like giant, wrinkled capers, with a firm, chewy flesh. As you can imagine, they are very salty, so I normally pit them, then let them soak in cool water for 30 minutes to remove the excess salt before folding them into the dough. If you’re on the fence about olives, I’d highly recommend trying this bread. Although I’m a bit fanatical about it now, I take consolation in the fact that my bread was also loved by my little nephew Cormac, who even asked for a slice to take along in the car with him.